Win! 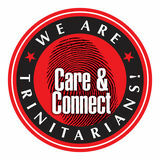 Email connect@trinity.org.sg to tell us what you think of the Trinitarian and how you were blessed by it. 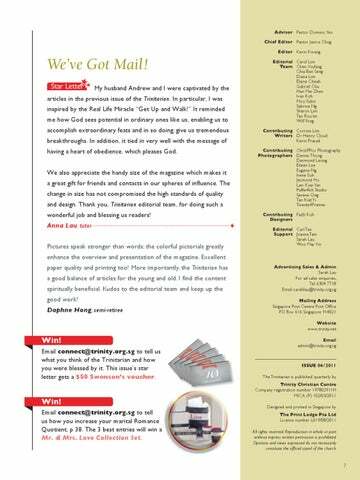 This issue’s star letter gets a $50 Swenson’s voucher. Win! Email connect@trinity.org.sg to tell us how you increase your marital Romance Quotient, p 38. The 3 best entries will win a Mr. & Mrs. Love Collection Set. Email admin@trinity.org.sg ________________________________ ISSUE 04/2011 The Trinitarian is published quarterly by Trinity Christian Centre Company registration number 197802911H MICA (P) 102/03/2011 Designed and printed in Singapore by The Print Lodge Pte Ltd License number L019/08/2011 All rights reserved. Reproduction in whole or part without express written permission is prohibited. Opinions and views expressed do not necessarily constitute the official stand of the church.